The book is nicely presented with editorial cartoons that depict the true reality of the present political ,economical,social conditions of India.The chapters are well planned. Starting with the first chapter it states the motive of the book.It shows the present political situation and the suffering of the people. How the Government policies are framed to benefit Industrialist and to fill pockets of the politicians associated.It also shows why the honest government officials become helpless.It reminds people of there rights,which is the prime motive of the book. 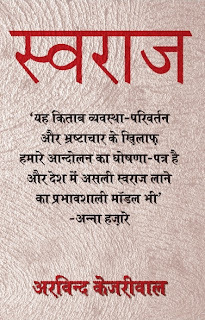 Next, author takes us back to history where our country had 'jantantra' and people decided the policies and king was just an authority.This worked till 1806 AD until the East India company came to India.They understood that jantantra is hindrance for them,so they banished the 'Gramsabha' and brought 'Collector' system. Moving ahead the book discusses the drawbacks of the present 'panchayati raj' system.Author also suggests some changes,introducing 'lokpal' and organizing 'Gramsabhas'. As we read further into the book ,the author discusses many drawbacks of Indian policy making. How the irrelevant policies are framed.Here's an example : A village was given fund, support for 'Drought' whereas the village is affected with 'Floods' .The village does not need water storage solutions but how to save themselves from the flood water. Therefore the author says that policies should be framed at the village level. How can we expect a person sitting in plush AC rooms,far away from the village,in Delhi offices to make policy for the village. In a country where languages ,culture ,geography changes every mile ,how can the policy be same for all villages!!???? Further author writes why just villages ,we can have 'mohalla gramsabhas' in cities where needs and requirements of the city people in that 'mohalla'(locality) can be addressed by the people and for the people.